Shirts With Random Triangles: Georgia linebacker Natrez Patrick arrested for second time on marijuana-related charges. 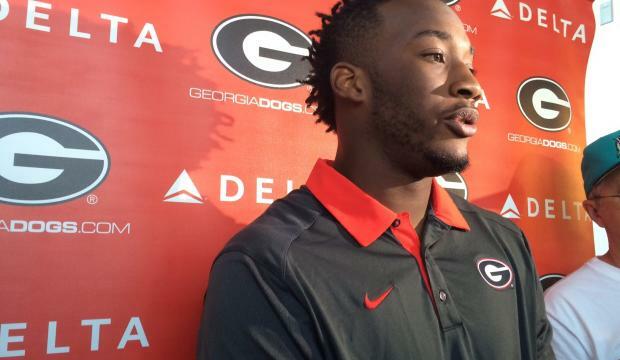 Georgia linebacker Natrez Patrick arrested for second time on marijuana-related charges. Natrez Patrick in 2016. Image via Online Athens. "Patrick was booked into the Athens-Clarke County jail at 11:37 p.m. on Thursday night on charges of possession of less than one ounce of marijuana and parking in a prohibited area. He was released on bond less than hour later." This is Patrick's second arrest on marijuana-related charges. Patrick and former Georgia defensive lineman Chauncey Rivers, were booked on charges of misdemeanor marijuana possession charges in 2016. Patrick was suspended one game following the incident, while Rivers was dismissed from the Bulldog football program. According to rules in the University of Georgia student-athlete handbook, Patrick could be suspended for four games, as this would be his second arrest.